This six-week Level 1 class is a perfect INTRO for those looking for fun and practical guidance around "How to" launch their own home CHANT practice! Within a safe space, this fun program guides and supports beginning Kirtan Leaders to launch a home chant practice and prepare to share Kirtan with others. 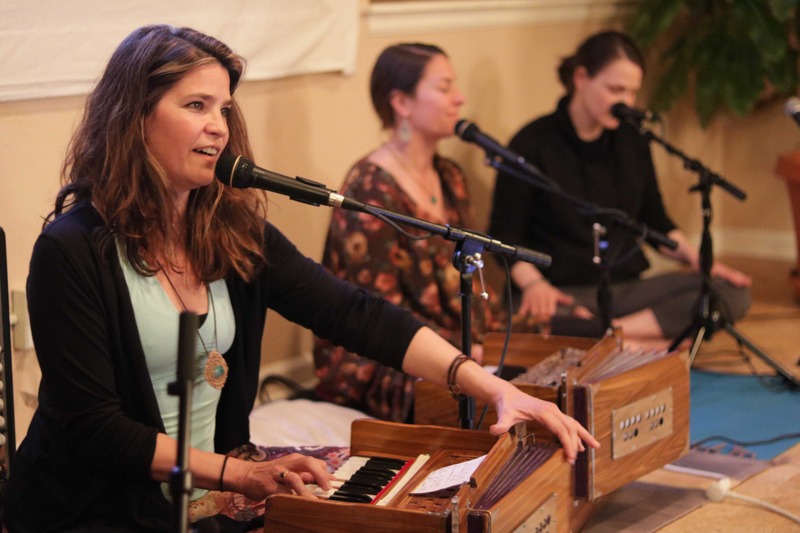 Weekly classes (90 minutes long) create a perfect structure for beginning chant leaders looking to deeper their harmonium skills and ability to play/sing with strong musicians while leading others in a potent chant experience. You will learn to sing and play (on the harmonium) six chants from your favorite Kirtan artists, connect with amazing community, have big fun and step into this exquisite heart-opening practice in a new and deeper way! Mike Cohen has trained and apprenticed hundreds of Kirtan Leaders, from total beginners to students he helped create and release original chant Kirtan albums. Mike guides his students to build thriving chant communities, lead with power and grace, write compelling original music, tour, play at festivals, create albums and, along the way, transform who they are being in the world. Mike’s three full-length Kirtan albums blend Eastern mantra and Western grooves in an intoxicating manner that is ‘inspiring, addictive and highly-chantable.” (Yoga Chicago Magazine). In 2018 he will release tracks from his 4th album- his second album created with renowned Kirtan producer Ben Leinbach (Jai Uttal, Deva Premal). Mike travels nationally sharing Kirtan at festivals and other venues, and leading his unique and effective Kirtan Leader trainings. Mike has guided a number of his students to complete Kirtan recording projects. In 2015, longtime students Tim Jordan (https://soundcloud.com/tim-jordan-kirtan) and Sevika Radecki (https://soundcloud.com/sevikakirtan/sets/love) released full length CD's of original chants. In 2016, Katie Wise (https://soundcloud.com/bhaktiexplosion/sets/bhakti-explosion-sampler) and Claire Whittleston (https://soundcloud.com/claire-whittleston) released album projects with Grammy Award nominated producer Ben Leinbach. Mike is currently support three students as they create Kirtan albums filled with original chant music. Boulder, CO based Dawnia Dresser is an Anusara inspired yoga teacher and lifelong vocalist/musician. During her 19 years in Los Angeles, CA Dawnia co-created three albums of original folk-rock music and contributed extensively on albums and movies as a vocalist and voiceover artist. Dawnia is currently working with renowned Kirtan producer Ben Leinbach (Jai Uttal, Deva Premal) to create an EP of soul-infused mantra music. A graduate of Colorado State University with a degree in music and vocal performance, Dawnia serves as faculty in the Boulder, CO based Kirtan Leader Institute. Her warm heart, clear and caring teaching style and beautiful voice have led her to become a beloved member of the Kirtan community in CO and beyond. "I loved learning to play the harmonium and I am so excited to have one now!! I've been playing everyday and I am hooked. It's amazing how great I feel everytime I chant, it's like the express way to bliss. I'm feeling so much gratitude for this practice and want to go deeper. I really feel like this is what I need to be doing. It feels so clear to me." "This is an awesome systematic training that gets you leading Kirtan quickly! I have attended three Kirtan training programs and this one, by far, generated the most beautiful connections and deepest learning. There was so much wonderful energy created with such beautiful souls - I can't recommend this program enough! "After just one session in your Learn to Lead Kirtan class I felt brave enough to take my Bhava Mini harmonium into my yoga classes. I played it for students in savasana and to "om" at the end of class. Since then, I've had at least one student in tears at the end of every class. It's incredible, the sound is so powerful! I even had the chance to lead a small Kirtan for a teachers workshop last weekend - so fun! Again, tears! Thanks!!" Class size will be limited to 12 participants to create a high-touch learning environment. This program runs six weeks with a total of 9 hours of instruction in how to launch your own home chant practice and perhaps even share with others! Or, mail a check to Mike Cohen - 3551 Nyland Way Lafayette, CO 80026. TERMS OF SALE: Customer assumes all risk or danger incidental to the training or event(s), whether occurring prior to, during, or subsequent to, the actual program(s). NO REFUNDS: All sales are final. No refunds will be granted. However, funds may be applied to future programs. LIABILITY AND PHOTO/VIDEO RELEASE: I grant permission to Kirtan Leader Institute and Shiva Datta Music, LLC to use any/all photos or videos taken of me, the participant, for any Kirtan Leader Institute and/or Mike Cohen Kirtan event promotional purpose, including but not limited to the website, brochures, Facebook events, newsletter, photographer/videographer owned footage or other promotional items. HEALTH DISCLAIMER: I certify that I, the participant, have consulted my physician and am in good health and have no physical or other impediment that would endanger me while participating. I hereby acknowledge that I understand all of the risks associated with this activity and knowingly agree to release, indemnify, discharge, waive and relinquish Shiva Datta Music, LLC (or its agents, employees, volunteers or parent companies or affiliates) from any and all liabilities, claims, or actions for personal injury, property damage, or wrongful death which may arise out of my participation.